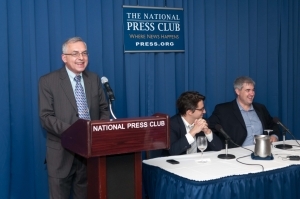 NPC's Book & Author Committee member Joe Luchock introduces Pulitzer Prize-winning journalists Adam Goldman (left) and Matt Apuzzo of the Associated Press before they discuss their book, Enemies Within: Inside the NYPD's Secret Spying Unit and bin Laden's Final Plot Against America at a National Press Club Book Rap, Sept. 10, 2013. Pulitzer Prize-winning journalists Matt Apuzzo and Adam Goldman of the Associated Press' Washington bureau want to start a conversation about what counter-terrorism measures are effective and which ones are not. Apuzzo and Goldman, have co-written a provocative book, Enemies Within: Inside the NYPD's Secret Spying Unit and bin Laden's Final Plot Against America. They appeared at a National Press Club Book Rap, Sept. 10. In their book, which the authors refer to as "a thriller," Goldman and Apuzzo write about a breathtaking race to prevent an al-Qaeda bomber from launching Osama bin Laden's attack on American soil. Weaved throughout the story is the discovery of a secret unit in the New York Police Department that was collecting data on the Muslim community in New York and New Jersey. In relating the story, Apuzzo and Goldman reveal how six months after the 9/11 attacks, New York Police Commissioner Ray Kelly hired a retired CIA agent, Dave Cohen, to update the police department's intelligence division. Soon after, the Terrorist Enterprise Investigation was sanctioned by a judge. As part of the investigation, the NYPD would dispatch a vast network of undercover officers and informants into Muslim neighborhoods to eavesdrop on conversations in mosques and community centers. But, ironically, for all the information amassed, the police department failed to identify the most imminent threats. During a lively Question and Answer session, the audience posed thoughtful questions and voiced its concerns about how it would be possible to conduct counter-terrorism operations without violating the privacy rights of citizens. Joe Luchok of the NPC's Book & Author Committee introduced Goldman and Apuzzo.